Smart technologies are the way forward in supporting CSC’s tried and tested performance management system to ensure quality and safety systems are operating efficiently on sites. For long-term client contracts, Charles Service Company has implemented some user-friendly smart technologies to help track its performance and provide an instantaneous and automated issues rectification system as well as GPS tracking to manage team member movements. Using tablets or “smart screens” client can send instant notifications to CSC’s centralised system. This sets off an automated system alerting management to any on site queries or issues. Other technology includes the NETCONNECT inventory management system, which assists in the replenishment of consumable products direct to site via an online platform. CSC also invests in the latest equipment, machinery and consumables to maximise our ability to respond to all types of commercial cleaning needs. Key additions to the CSC equipment arsenal include the I-mop and I-gum machines. We also introduced ZOONO to the WA marketplace, one of the most environmentally friendly and powerful sanitisation products available. CSC uses the revolutionary I-mop. Th I-mop is a new type of cleaning delivery system that replaces the traditional mop and bucket process. It improves cleaning efficiency, while also significantly reducing water consumption and the potential for user fatigue. The I-mop features a high-speed twin brush scrubber drier deck with a working area of 46 cm. Balanced weight distribution and twin counter-rotating brushes remove more surface soil that a regular mop and bucket. We also introduced Zoono® to the Western Australian marketplace and is currently the only professional cleaning service provider in WA to adopt the use of Zoono. Zoono a powerful environmentally friendly sanitisation product that kills germs and bacteria with no harmful chemicals. 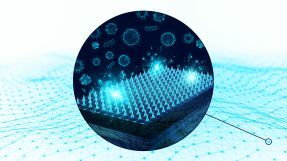 It works by forming an invisible barrier of microscopic pins that physically destroy 99.99% of bacteria. The protective layer takes effect as it dries.